Our worship service this Sunday is going to celebrate God’s good creation and invite us to reflect on our role in being good stewards of that creation. What better way to understand the connection between our faith and our care for the Earth than to have David Dumaresq–“Farmer Dave”, our Community Supported Agriculture provider–reflect with us on his journey from being a philosophy major at St. Anselm’s College to being a Peace Corps member working with Ecuadorian farmers, returning to the States and being invited by a farmer’s family to take over the farm (where Dave once worked) after the death of the farmer, to working as an advisor for the U.S. Agency for International Development in the former Soviet Republic of Georgia, back to the States, later on with US AID to Ethiopia, establishing a CSA in Massachusetts, and so on and so on. I had a wide ranging conversation with Dave last week, and it was remarkable how concepts such as answering the call, using one’s gifts, “coincidences” (“God’s way of remaining anonymous” as the saying goes), and being given a gift for a reason–all good, solid words we often use in church–came up. Add to that a strong sense that Dave has of being a good steward of the land and not abusing it provides lots of “food for thought”. So, Farmer Dave and Pastor Mike will have a dialogue during the Sermon time, and Dave will also be available at Fellowship Time for conversation and follow up questions. I hope you can join us on Sunday as we celebrate Earth Day (four days late) and commit ourselves to being good stewards of the precious gift we have been given. Remembering Jesus’ entry into Jerusalem to confront the power of sin and death. In keeping with tradition, there will be a palm procession, special music, and the dedication of our One Great Hour of Sharing offering. Youth will be confirmed. Children will share in a special activity. “Maundy Thursday” gets its name from Jesus’ “new commandment” (mandatum in Latin) to love one another as He has loved us. A brief service with celebration of the Lord’s Supper — on the night we remember Jesus’ last meal with his disciples. Communion is served around the communion table. It is “good” Friday because, despite appearances, it is God’s Friday. A vigil of prayer, readings, and extinguishing of candles in the darkened sanctuary, as we reflect on the meaning of Jesus’ crucifixion, of our lives, and our world. With cries of “He is risen!” we greet one another at our annual Easter Breakfast. Coordinated by Mark and Cheryl Wells. Worship will celebrate the heart of the Good News, with jubilant music. This is the love that overcomes death! No Sunday School – worship will be for the whole family. There will be child care for infants and toddlers only. The new Board of Deacons met for the first time on Feb 4th. Kathleen Stegall was elected Moderator and Caitlin Rivet will continue as Coordinator.. The new deacons are Colette Greco (returning for a 2nd term), Linda McCusker and Jackulin David. Please see the attached list for the offices. The new board has been active already … making sure that the members of our congregation have been safe during these horrible winter storms. One Great Hour of Sharing offering for the Presbyterian Church, USA goes to support water and hunger projects, disaster relief and empowerment programs. Thanks to our gifts, people affected by disaster are helped to rebuild their lives and their communities. The ministries of the Presbyterian Hunger Program and Self-Development of People help individuals and communities to battle hunger, disease, unemployment and environmental problems. 2014 was $1879.00. We would like to do better this year. The need is great both here in the United States and throughout the world. It is more blessed to give than to receive. Are you sick of the cold and the snow? Here comes Farmer Dave to rescue us! It has been a really tough Winter, so far. We have 90+ inches of snow on the ground. It will all eventually melt. While we are waiting, Farmer Dave will begin to give us a little taste of Spring, starting March 2. Farmer Dave has been working hard getting veggies ready for us. Look at that beautiful baby elegance mix. Soon you will be eating it! Pick-up times for spring are 4-6:30 pm. If you have not signed up yet, hurry! You don’t want to miss out on the tender baby vegetables that will soon be here. It’s not too late. For more information, see Jane or Amanda. The event will feature wine tasting, gourmet appetizers, live auctions and silent auctions. Auctioneer is Steve DiOrio (from Billerica). Only 200 tickets will be sold. Tickets can be purchased at Spencer Cleaners, 271 Cambridge St. and 240 Middlesex Turnpike; at A Whole Bunch of Flowers, 326 Cambridge St.; or by contacting Linda Roscoe, 781-273-2083. Co-sponsored by Burlington Public Schools and the Burlington Area Chamber of Commerce, this is a concert for the entire family with no worries of lyrics that will make anyone uncomfortable. This is music that has spanned the generations for generations and stands the test of time! Tickets are now available for the Glenn Miller Orchestra and can be purchased online at BurlingtonTheatre.com, by phone at 781-A-FUN-TIC or at the door. Ticket prices are $20 for senior citizens and students, $25 for adults. All seats are reserved. The Fogelberg Performing Arts Center, an accessible venue, is located at Burlington High School, 123 Cambridge Street, Burlington. Likewise, to our Farmer Dave volunteers while Jane visited in Denmark – Mary Lou, Kathleen, Peggy, Judy; and those who delivered the leftover produce to the pantry and senior center – Joseph, Joan and Linda. And to Hospitality members, especially Sally, for one of the best-attended and exuberant church picnics ever! stewardship has fallen behind a little more than usual over this summer. Candy McLaughlin, Rob Greco, Anne Denier (our wonderful cook) and Rod MacDonald joined 24 other folks from 4 other congregations – including from the UCC church in Vermont now pastored by Judi Horgan (former BPC member) – as a very diverse team doing housing rehab for Mission at the Eastward, July 25-30. It was a very positive and rewarding week, and the team thanks all the BPC members who contributed kitchen supplies and funds for our effort! Our Community Supported Agriculture program climbed to 75 members during summer. Farmer Dave’s farmshares pickups continue on Monday afternoons. As you may have noticed, there have been big changes to our Fellowship Hall and hallway. Thanks to a very generous donation from the Nurturing Nest Preschool, we were able to provide new window treatments, paint and stain to update the look of our wonderful gathering place. We hope that, if you haven’t already, you will soon have a chance to enjoy our new Heaven on Earth (that’s the actual name of the paint color!). In I Corinthians 12:12-27, Paul compares the church to the human body. Each part of the body has its own special function and each is important to the entire body. In our mobile society, church members come and go with great frequency. This often creates a gap which needs to be filled. As we approach the time for the annual stewardship campaign, please take time to consider what role you are being called to play. Can you be a church school teacher, a deacon, an elder, or a worship assistant? Do your talents include making needed repairs or in landscaping? Are you being called to increase your pledge to help with the budget deficit? Just as every part of the body must do its job if the body is to be healthy and able to function, so each member of the congregation needs to be involved if the church is to remain healthy and viable here in Burlington. The Peacemaking Offering is the last of the four church-wide special offerings. This offering was created by the General Assembly thirty years ago to support the work of peace at all levels of the Presbyterian Church, USA. Half of the offering is shared by congregations, presbyteries, and synods. The remainder helps the national church develop resources, events, and programs to assist the church in responding to Christ’s call to be peacemakers. In recent years, our share of the offering has been used to help provide scholarships to local high school students who have best demonstrated peacemaking during their high school years. In 2010, two scholarships were awarded to Brinda Patel and Adrianna Merrill. The Peacemaking Offering will be received on October 3, World Communion Sunday. More information will be available through bulletin inserts during September. Please support this special offering and, most of all, be peacemakers in our troubled world. Yes, there will be a yard sale but the venue will be a little different. It will be held September 18, at 13 Lido Lane in Bedford. So bag up and box up that great stuff you just can’t use or don’t have room for and get it to the Brunner’s. The proceeds will go toward paying off the organ. 10% will go to our mission fund. Obviously I will need help. I will need people to bring tables from the church and people to put items out and to help with pricing etc. The same rules as a yard sale at Church will apply. 	All items should be clean. 	If an item is not working it needs to be noted with what the problem is. 	Text books must have been published within the last 5 years. Look for a sign-up sheet on the bulletin board. There will be an Arts and Craft Fair at our church, October 23. We are in the process of getting crafters who would like to display and sell their art. We need people to help set up and take down tables and set up for Sunday school. Most everything in Fellowship Hall will have to be moved out. Set up will take place on Friday afternoon and early evening. This fund raiser is being coordinated by Jane McIninch and Judy Brunner. The proceeds will go to the general fund, 10% will go into our mission fund. See either Jane or Judy if you want to help. First farm share pickup today! Just a reminder that if you’ve signed up for a share of locally-grown, sustainable produce from Farm Dave, the first pick-up date is TODAY, June 14th, from 3:30 to 6:30 at Burlington Presbyterian Church (335 Cambridge Street in Burlington, MA). We’ll be having a bit of a festive day today to celebrate! Can’t wait to see you there! Burlington Presbyterian Church and Farmer Dave’s, a sustainable farm in Dracut, MA, have teamed up the first time to bring locally-grown, freshfruits and vegetables to the town of Burlington with a Community-Supported Agriculture (CSA) program. In the CSA program, consumers become shareholders of the farm for the season the season by paying for their share of the harvest upfront, and in return will receive a share of freshly-harvested produce for 20 weeks from mid-June through late October. Shares will be conveniently boxed and ready for pick-up on Monday afternoons from 3:30 – 6:30 p.m. at Burlington Presbyterian Church. Payment plans are available. 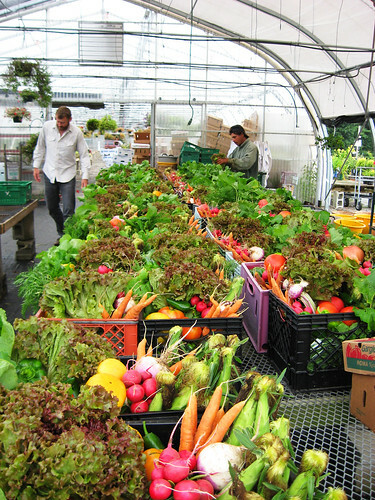 Every week, from mid June through October, CSA members will receive a share of fresh vegetables grown exclusively at Farmer Dave’s fields in Dracut and Tewksbury, available in small, regular, and “super-family” sizes to suit the produce needs of individuals to large families, vegetarians and omnivores. Every share includes generous portions of the season’s bounty, each in its due time, including summer favorites such as tomatoes and corn, cooking staples like onions, carrots and potatoes, as well as chefs’ picks like chard, beets, and other novelties to experiment with throughout the season. Farmer Dave employs sustainable farming methods to ensure products that are healthy, nutritious, tasty and responsibly grown.The CSA also offers a fruit share featuring strawberries, raspberries, blueberries, melons, peaches and apples. The fruit is perfect for breakfast, a snack on-the-go, or a healthy dessert. Businesses will often purchase a fruit or vegetable share to split amongst the employees in the office or subsidize shares as a Health and Wellness benefit. In an effort to relieve hunger in the Burlington area, Burlington Presbyterian Church and FarmerDave’s will donate surplus produce to the Burlington Community Food Pantry each week. In addition, CSA members will have the option of donating funds towards the purchase of sharesfor the food pantry. Farmer Dave’s donates hundreds of pounds of produce to hunger relief organizations in the greater Lowell/Boston area every year. For more information about 2010 CSA membership including pricing, payment plans, and more,contact Farmer Dave’s at (978) 349-1952 or visit http://www.farmerdaves.net to register. Farmer Dave’s (http://www.farmerdaves.net) is based in Dracut, MA. Farmer Dave Dumares grew up working on farms in Dracut. Through the Peace Corps and other agencies he has helped farmers in Ecuador, and other Latin American countries become more sustainable. In 1997 he returned to Dracut to farm. In 2006 Farmer Dave purchased and helped to preserve a 30 acre farm in Dracut that will remain as productive farmland for future generations. Farmer Dave is committed to growing high-quality, healthy food that is good for the people who eat it, the workers who tend it, and land that provides it, year after year. In addition to serving the Burlington community, Farmer Dave’s offers CSA shares in Dracut, Tewksbury, Lawrence, Somerville, Gloucester, Beverly, Jamaica Plain and Boston.